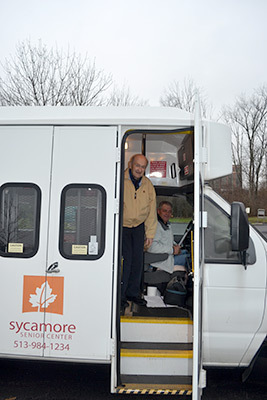 Sycamore Senior Center previously provided transportation out of their Blue Ash location. Maple Knoll Services For Seniors is now located in Springdale across from our main campus. Maple Knoll Outreach Services for Seniors, (MKOSS), is a Council on Aging, (COA), provider. However, MKOSS will offer transportation for a private fee. Contact (513)-721-1025 Ext 3 to find out if you qualify for one of COA's programs. Last year alone, the transportation program provided services for over 400 clients per month which accounted for more than 5,000 trips reaching over 41,200 miles. MKOSS offers transportation Monday through Friday to medical appointments, and specific non-medical transportation. All appointments must be between 8:30am-2pm. Drivers WILL wait after 2pm to transport clients home. A wheelchair accessible van is also available for those requesting assistance. All appointments need to be scheduled early and advanced to help secure your appointment. MKOSS operates on a first come, first serve basis. Make sure MKOSS can service your transportation needs. For information on pricing and/or to schedule transportation, call (513) 686-1002 or email our Transportation Coordinator.